Spring is in full swing, and rainy weather is the norm in many parts of the country. Though many of us drive in the rain on a fairly regular basis, and like to think of ourselves as expert drivers, driving in heavy rain can be tricky and even dangerous. We would all benefit from brushing up on our wet weather driving skills every once in awhile. Here are some useful tips for driving in the rain. This might seem easier said than done at times, but the best advice for driving heavy rain is to simply avoid it if possible. Only take necessary journeys, and if public transport is an option, take it. If you must go out in your car, try to plan your journey so as to avoid the most hazardous and congested highways if possible. Vision is poor, reaction times are slower, and the slick road means that it can be harder to stop. This is why, to prevent accidents, you should drive slower than you would usually, 10 or even 20 miles per hour below the usual limit. This will give you more time to brake and give you greater control over the vehicle. Again, in heavy rain it will be harder to see what is around you, and it will be harder to slow down in case of emergency. This means that it is important to look well ahead and around you as you drive, so that you can anticipate upcoming hazards. Furthermore, you need to brake earlier and more gradually. This is a good safe driving technique regardless, but in the rain it is crucial. Braking late can cause skidding, hydroplaning, and potential accidents. 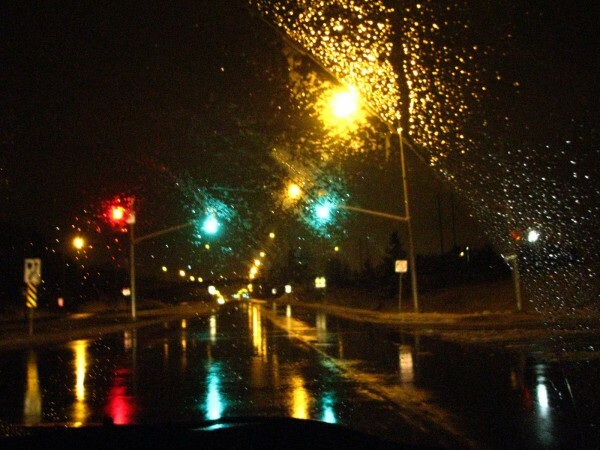 Even though it might not be the night time, it is safer to have your lights on when it is raining. It is often darker, and the rain makes for poor visibility. Turning on your headlights makes it easier for you to see, and easier for others on the road to see you. The last thing that you want when driving through a tricky stretch of road in the rain is for the cruise control to kick in and cause the vehicle to accelerate. Always turn cruise control off when driving in the rain. You can only drive as safely as your vehicle allows. Make sure that your headlights, brakes, wipers, and the tread on your tires are all in good working condition. –do not brake or turn suddenly. — ease your foot off the gas until the vehicle slows and you can feel traction on the road again. –turn your steering wheel in the direction of the skid. As you recover control, gently straighten the wheels. –if you need to brake, do so gently, using a light pumping action if you don’t have anti-lock brakes. For more tips like these, like us on Facebook, Twitter, or Google+.